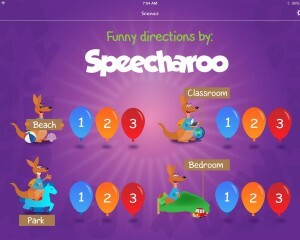 Posts Tagged "speech therapy apps for kids"
HomePosts Tagged "speech therapy apps for kids"
Funny Directions by Speecharoo is one of my very favorite iPad apps to use with preschoolers and early elementary age students! It is fantastic to use to work on following 1/2/3 step directions, but it also great for eliciting language and comments. The funny animations in the app really draw out language (and laughs!) from my kids! It’s super simple to jump in and start using the app. From the home screen you can see above, you tap a balloon to choose which setting you want (beach, classroom, park, or bedroom) and what level of directions you want (1, 2, or 3 step). 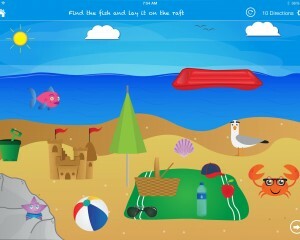 In the picture above, I have chosen the beach scene and 2 step directions. The app reads the direction and then the child moves the pieces to follow the direction. When the direction is completed correctly, a cute animation and super funny audio is played. This is what makes the app really fantastic! It is very engaging for kids keeps them wanting to listen closely and get the direction correct so they get the reward of the silly animation. Each scene has 10 directions so it is very easy to take data. The app keeps track for you as well! One minor complaint is that you can’t switch back and forth between different players who may be working on different levels of following directions. The app is so engaging for the kids though, my students loved watching other play and were super excited when it was their turn. The app is terrific for following directions, auditory memory, and prepositions. I also use it with my students with autism to elicit comments and conversation. It is also great as a reinforcement activity because kids love to play it! It is available in the iTunes store for $2.99 which I think is a steal for such a fun and useful app.